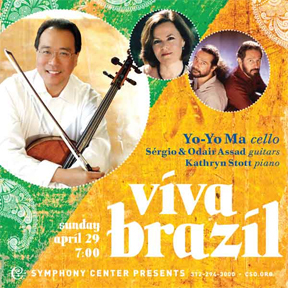 Enjoy a special evening of rhythm and passion with renowned cellist Yo-Yo Ma and guitarists Sérgio and Odair Assad. This evening’s program will feature beautiful works by Villa-Lobos, Piazzolla, and Jobim. Viva Brazil! will take place Sunday, April 29 at 7pm at Symphony Center, 220 S. Michigan Ave.